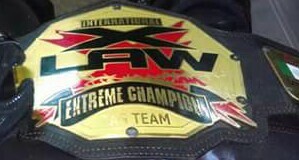 The X-LAW Tag Team Championship is a professional wrestling championship promoted by Xtreme Latin American Wrestling. The championship was established in 2001. Currently is defended in Tijuana. Crazzy Boy and Joe Lider wrestled against Angel o Demonio and Shiryu Dragon for the vacant belts on December 14, 2005 in Xalapa, but the match did not had winners. 7 Damián 666  & Estrella Dorada Jr. Damian 666 & Estrella Dorada Jr.
↑ Relevos Incriebles Cage Match. ↑ Tag Team Match for disputed titles. Unified with the FILL Tag Team Championship. This page was last edited on 23 December 2018, at 11:48.